The Procurator Fiscal reported an average of 110 hate crime charges per week in 2016/17. 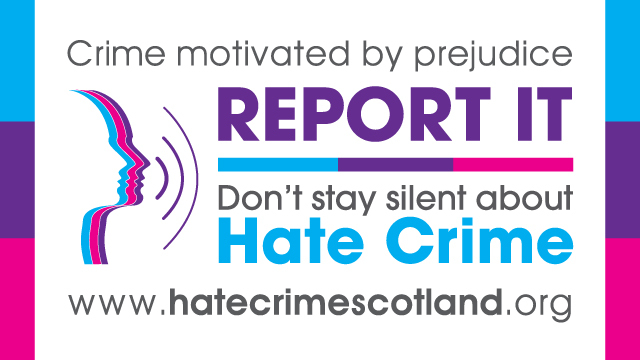 59% of hate crimes reported by the Procurator Fiscal in 2016/17 were racially motivated. The Procurator Fiscal reported an average of 9 charges of racially motivated crime every day in Scotland in 2016/17. The number of religiously motivated charges reported by the Procurator Fiscal in Scotland increased by 12% in 2016/17, compared to the previous year. Roman Catholicism was the subject of reported abuse in 57% of religiously motivated charges in 2016-17. In 2016/17 the number of charges where conduct was derogatory towards Islam decreased by 16% compared to 2015-16, from 134 charges to 113 charges. Protestantism was the subject of reported abuse in 165 charges in 2016-17, which is 19% of the total religiously motivated charges. 30% of all hate crime charges in Scotland in 2016/17 are reported by the Glasgow Fiscal Office. 28% of all Racially aggravated crime charges in Scotland in 2016/17 are reported by the Glasgow Fiscal Office. In 2016, an Equality Network Survey found that 64% of LGB respondents had experienced hate crime. A Scottish survey of LGBT hate Crime Victims in 2016 found that only 1 in 10 incidents were reported to the police. There were 1075 sexual orientation aggravated charges reported by the procurator fiscal in 2016-17, a 5% increase on 2015/16. This website provides information and resources relating to crimes motivated by prejudice, or hate crime. There is growing understanding among services that crimes motivated by prejudice have a damaging effect on individuals and communities. 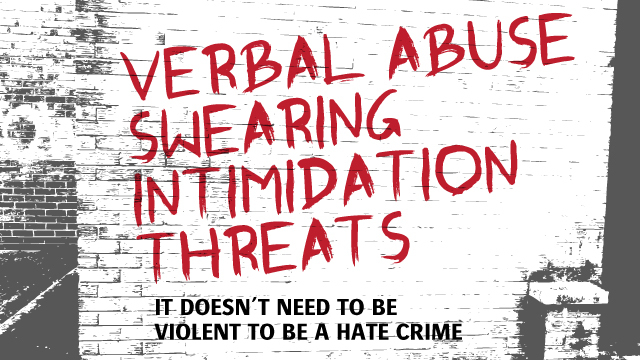 Social isolation, feelings of anger, shame and embarrassment, mistrust, depression, fearfulness and anxiety are all common reactions for victims of hate crime. These in turn can impact on many areas of life including employment, education, health, housing, relationships and ability to fully participate in society. 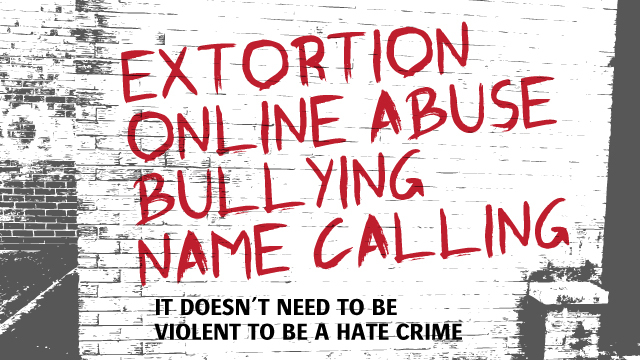 The harm of hate crime goes further and we recognise that the impact of hate crime extends beyond the individual victims who experience the hostility, to whole communities and social groups. Good social relations generally are undermined by hate crimes, as they create mistrust and suspicion between communities. This makes hate crime an issue for every service and every community. The Scottish Government has made it justice strategy priority to enable communities to be safe and supportive, where individuals exercise their rights and responsibilities. This means that promoting good relations and tackling hate crime should be a priority for public agencies such as local authorities, as well as Police Scotland. We are all responsible for working together on the government’s priorities for justice. Community Safety Glasgow is responsible for this website. 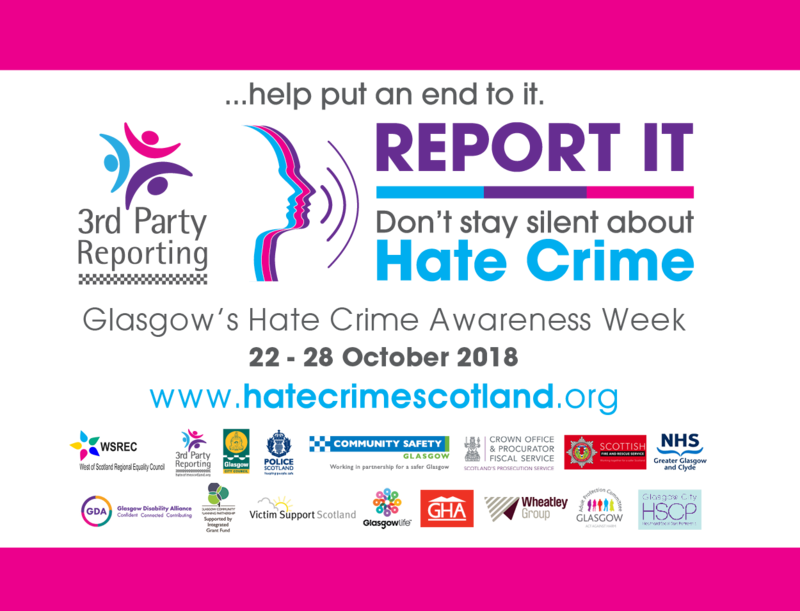 Along with our partners, we are working to increase awareness of hate crime, prevent hate crime from happening, encourage reporting when it does happen. 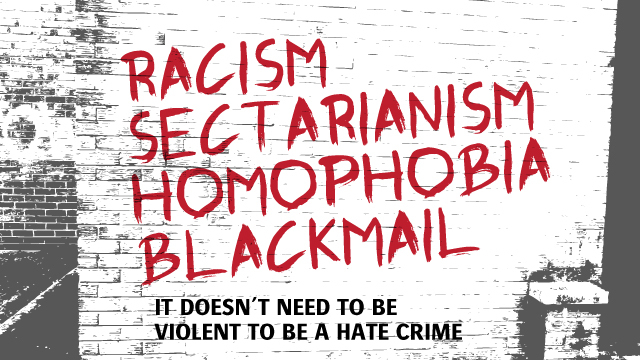 Although Community Safety Glasgow has a local focus on the city of Glasgow, the website includes information focused on hate crime that is useful nationally. The police will record the incident that you have reported and then carry out an initial investigation to determine whether the incident falls under the legal definition of a crime or breaches any statutes. If it does, it will then be recorded as a crime. The police will then carry out a crime investigation. This will involve interviewing victims, witnesses and suspects, looking at other sources of evidence such as CCTV footage or forensic evidence. If they believe they have enough evidence to support a prosecution they submit a report to the local Procurator Fiscal. The Procurator Fiscal (PF or Fiscal) works for the Crown Office and Procurator Fiscal Service (COPFS), which is the body responsible for prosecuting crime in Scotland. The Procurator Fiscal (PF) considers the police report and decides if there is sufficient evidence to proceed. If there is, the Procurator Fiscal will then decide what, if any, action it is appropriate to take. Actions range from prosecution in court, direct measures such as warnings, fiscal fines, compensation offers and social work diversion. The Procurator Fiscal can also decide to take no action. When this happens, the victim can ask for an explanation of the decision. If court proceedings are appropriate, the Procurator Fiscal will decide which court these should be taken in. This decision will depend on the nature of the offence, the sentencing powers of the respective courts and whether the accused has a criminal record.